Adjacent to the new world-class performing arts center, the Smart Financial Centre at Sugar Land, sits a vibrant plaza with a unique mix of amenities including a beautiful and interactive water fountain, public art sculptures, a tree covered grove, a designated Food Truck lane, and a large lawn area with lighting and streetscape enhancements for residents and visitors to enjoy. The Plaza features innovative LED lighting that lines Lexington Boulevard and provides a multi-colored spectacle. The Plaza serves as a Destination Venue which is intended to be used for various purposes including a gathering place for citizens, a place to hold public and private events and serve as a forecourt to the Smart Financial Centre. One of the best features of the Plaza is the interactive fountain! The splash pad water feature is FREE and open to the public from April 15-October 15. It is available seven days a week from 8am to 4pm, with the exception of Mondays from 8am to Noon for maintenance and during scheduled events or shows at the Smart Financial Centre. In the evening, the fountain transforms into magnificient water shows, enhanced with LED lighting, that occur on the hour at 5:30pm, 6:30pm, 7:30pm and 8:30pm. Four water shows, all containing their own variation of light and water sequences, were specifically designed for the Plaza fountain by a globally recognized commercial water feature company. 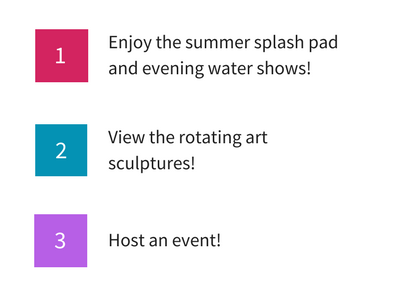 To host an event at the Plaza, a Reservation Request Form must be submitted to the Plaza Administrator. Upon reviewing the completed reservation request form, the Plaza Administrator will determine whether it meets the criteria of a General Rental or a Special Event. Additionally, if the reservation is a Special Event, a complete Special Events Application must be submitted a minimum of 45 days in advance. All General Rentals and Special Events can be reserved no more than three months prior to the event date. Availability of the Plaza is first come, first serve and dependent upon scheduled shows at the Smart Financial Centre. 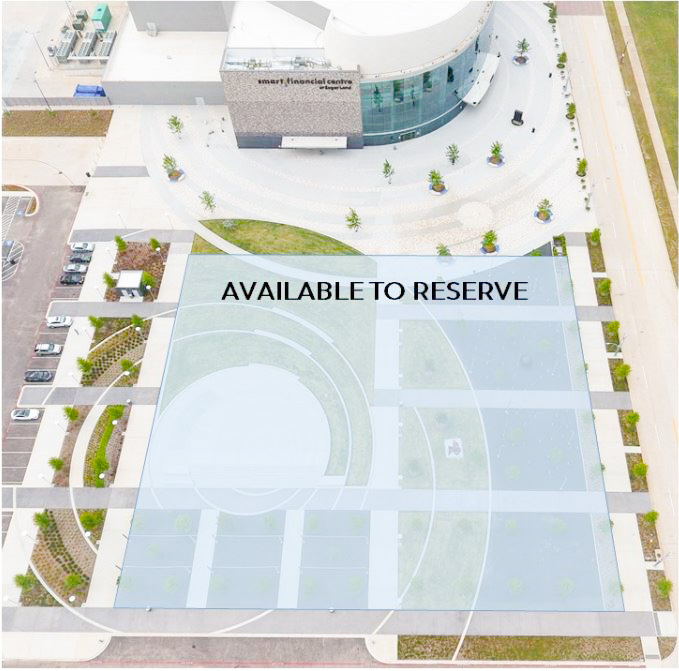 To view the available area to be reserved, please click here. The restrooms, interactive fountain and perimeter sidewalks must remain open to the public at all times. Plaza Ordinance 2084 defines a General Rental as utilization of the plaza for the purpose of hosting an event which does not impact public property by exceeding the plaza&apos;s capacity or requiring additional City Services. A Special Event is defined in the Special Events Ordinance as a unique activity, ocurring for a limited or fixed duration, and having an impact to public property that impedes, obstructs, impairs, interferes or disrupts normal or usual use of City property, facilities, or right-of-way. Special Event includes activites originating outside the City limits and entering into the City resulting in an impact to public property exceeding the established capacity of such property. Click here to review the City of Sugar Land Inter-Departmental Policy and Procedures regarding the Plaza adjacent to the Smart Financial Centre. Food Trucks that have obtained an annual food truck license are permitted to sell food and beverages in the Plaza in the designated Food Truck lane after securing a reservation through the Parks & Recreation Department. Reservations are available Monday-Friday: 5:00pm-9:00pm and Saturday-Sunday: 11:00am-3:00pm. Make sure to follow us on Facebook, Twitter and Instagram for all the latest news on things happening in Sugar Land. Our handle is @VisitSugarLand. Tag us in your posts and share your experience: #VisitSugarLandTX, #TravelSL. For more information, contact us at 281.275.2045 or tourism@sugarlandtx.gov.